When running a business it can feel that things like your company logo are a low priority. However, it is actually really important for businesses to think carefully about their logo; an effective design will help your business to make more of those all-important sales! Your logo is the first impression your company makes on a client and as such it’s crucial to make one that will reflect what your business is all about. One simple symbol accompanied by the name of your company plus maybe a few more words must contain within themselves the whole essence of your enterprise. Are you a modern industry equipped with all the latest shiniest technologies and the most up-to-date business strategies? Are you a family business, dating years back, with an accent on traditional values? If your logo does not illustrate your company philosophy, you may have a problem. If people get the wrong impression from your company’s logo, they won’t do business with you, and if they do they might end up disappointed, and as a business owner you want anything but that! Being memorable – standing out from your competitors a good company logo design is all about being memorable, and being memorable is one of the key ways you can stand out from your competitors. Research firmly asserts that people are more likely to buy from familiar brands or companies than from someone entirely unknown and this is why a memorable logo design is so important. Don’t blend into the crowd – you want to rise above it! Being professional – building trust Professional design work creates an image of a professional company – proud of what they do and willing to invest in building their brand identity. Until you build a relationship with a customer they will worry about what kind of service they are going to get – a poorly designed company logo, website or stationery will make many customers wonder about where else corners are being cut. Being unique, creating customer loyalty – The purpose of your logo design is to convey what your business is about, in as fast a time as possible. If you use your logo design to help broadcast your unique selling points you will be helping your customers to remember exactly why they should pick you every time they come across your logo. Building a brand identity, marketing your company – Remember that your logo design will be at the heart of every marketing campaign you ever do. Spending time getting the logo design for your company right first time around can really save you time in the long run by making ideas for campaigns, slogans, taglines and further artwork much easier. Great logo design helps your sales – It’s easy to see how great design work can directly help your business to thrive. It’s easy to regret a ‘slapdash’ logo design later down the line, and it only takes a tiny bit more investment of time and money to get a logo design that you can be proud of and which can really help you to achieve your business goals. You get what you pay for – There are some business owners who choose to use pre-made templates for their logo, but in light of what was discussed above, this strategy is obviously flawed since those templates are rarely perfectly adapted to one’s company. Those generic images lack in uniqueness and will not make your company memorable and easy to recognize. A professional logo designer can create a logo that will truly represent what your company is and what it stands for. Get a second opinion – Your company logo design is often the first impression you’ll make on a client, which is why it’s important to make sure you have a logo that properly represents your business. Smith Design Agency is always happy to talk over your company logo design. Whether you want to know if a redesign is a good idea, or if you’re trying to figure out what kind of logo you want, you can always get in touch. 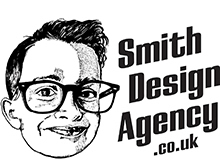 Smith Design Agency specialises in helping local businesses in Northern Ireland with Logo Design and Re-branding.